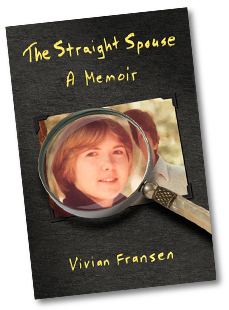 The Straight Spouse: A Memoir is now available, published by Open Door Publications. The Straight Spouse: A Memoir is a love story about a woman who is married to a man who turns out to be gay—and how she deals with it in unexpected ways. This story takes place in the early 1990s, and she believes she is the only woman in the world to face this unthinkable threat to her marriage. Her journey—sometimes disturbing, sometimes uplifting—is all about the importance of letting go and finding one’s own way through hard times.